Here's my review of this month's Loot Crate (or is it LootCrate? I see it both ways). If you don't know, Loot Crate mails you a box of fun geekness each month for about twenty bucks. New this month was some "level ups" you can order. One of them is an extra wearable for about $15 more. I missed the deadline for ordering this month, but I will get one next month and report accordingly. Wonder Woman Poster (DC has been doing a series of Super Women in old-timey themed art) - I will not use this but I appreciated that the poster came rolled nicely in a box and not folded. A Ledgend of Zelda Sweatband (wrist) - It's nice quality, but I won't use it. My kids seemed uninterested in paying with it for more than 10 seconds. I will likely give it to my brother, but he has a full-on Link Cosplay outfit, so he'll either love it or it will be beneath him. Batman Multi-Tool Keychaiun - This looks awesome and feels well made. I have a multi-tool on my key chain already, so I just replaced it with this. There's a good chance I only use it for a couple months due to it's size, but I do like it. League of Regrettable Superheros hard back book - This is my favorite item in the box this month and it went straight on my sci fi book shelf. Batman Figure - This is kinda cool. It is the oldschool, TV, Batman. You can't tell in the photo, but there is a little speech bubble that you can write on with a dry erase marker. Vulcan Gang Sign Air Freshener - I already have this in my car. I'm sure this was one of the cheaper items to include, but I like it. Brawlhalla - This is a code for a game on Steam and some extras. I will definitely load this on my Steam account. If I played games anymore, it would be nice, but I tend to collect games on Steam more than play them. All in all, I can't say I'm disappointed, but I'm also not overwhelmed. Overall, it's a good create, but for my personal interested, it wasn't overflowing with goodness. I'd put the value to me at just about what I paid for it, but not more. For others, I'm sure this crate would be awesomeness cubed. I am looking forward to getting the wearable upgrade next month and seeing what it is all about. 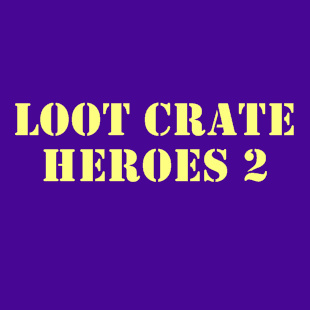 If you would like to try out Loot Crate for yourself. Please follow this link and help me get a few bucks off my order.